Why a perfect side dish is so important? Side dishes are awesome. Most people don't appreciate them. Choosing the right side dish makes all the difference and balance your lunch or dinner. Delicious sides can change the game on your daily menu. We choose the best sides to make the bbq experience the best of it. There are certain side dishes that are practically mandatory at a barbecue: corn, greens, smokey sweet potatoes to name a few. These classics pair perfectly with ribs or a big or a meaty burger. But if you want to take your bbq side dishes a bit further, we have options for you too. Try our orange and fennel salad for a fresh touch, spicy twist on our Pickled slaw or the Grilled sweet potato to get smoky flavor. Shredded cabbage can be traced back as far as the ancient Romans, who enjoyed the cruciferous vegetable with melted butter, vinegar, and oil. The Dutch introduced to America ”koosla.” “Kool” was the Dutch word for cabbage, and “sla” salad. Overtime, koosla was Americanized into coleslaw. Coleslaw first appeared in print in 1785! The reason why coleslaw has developed a mediocre reputation at best is likely because this is one of those dishes that you must have prepared correctly. And, it needs to be eaten fresh. Furthermore, coleslaw is ideally chilled overnight, allowing the dressing to infiltrate the vegetables. Our slow smoked meats go perfectly with our pickled slaw its perfect to cut the reach meats perfectly. Three simple words for a dish with such a complex history, that it has become a classic if not the quintessential American food to grace dinner tables since the Colonial era. But where did it come from? Who “invented” it? And last but not least, how did it become one of the most beloved comfort foods of all time? 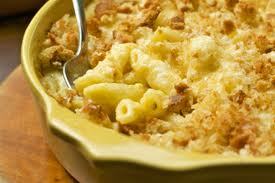 The American macaroni and cheese has two main lines of ancestry claimed. In the first, it is thought that macaroni and cheese was a casserole that had its beginnings at a New England church supper. In southeastern Connecticut it was known long ago as macaroni pudding. In the second, and more famous story, and more than likely the original story, it is said that the classic American macaroni and cheese returned with Thomas Jefferson to Virginia after his sojourn in Italy. Jefferson had brought back a pasta machine from Italy. His daughter Mary Randolph became the hostess of his house after Jefferson's wife died and she is credited with inventing the dish using macaroni and Parmesan cheese. Later, the Parmesan was replaced with cheddar cheese. Anyway, that's one story. It is more likely that Jefferson encountered the dish in Italy and brought back the recipe. Grilled meats such as Jalapeño Chicken and Tomahawk Pork Chop are complemented by starchy sides such as our decadent smoked Mac & Cheese! How did Eggs Benedict get its name? ​Eggs Benedict is a classic menu item, but why? Are where did it get its name? Who was benedict? Legend has it that a hungover Wall Street broker brought Eggs Benedict into the world. In 1894, in the Waldorf Hotel in New York, Lemuel Benedict ordered two poached eggs on top of buttered toast, crispy bacon and two poached eggs… plus the hollandaise sauce, of course. Oscar Tschirky, Head Chef at the time loved it! So, Eggs Benedict were added to the breakfast and lunch menu, but with a small few changes – Candian bacon and toasted English muffin replaced crispy bacon and toast. So let’s take a closer look at the different parts that make up this breakfast legend! Poached Eggs: The best eggs? Breakfast is the most important meal of the day, right? Yep, science tells us that we should never skip breakfast! If you are going to eat breakfast, you might as well do it in style with a delicious poached egg. Whether plopped on top of your avo toast or paired with a smoked pork belly, a water-cooked egg is a delicious (and healthy, obvs) way to add some vegetarian-friendly protein to your brekkie. But it’s also one of the more intimidating stovetop techniques. Get your hand on it and try to make it at home! 5. Scoop it out ... and enjoy of this delicious God creation called Poached eggs! Hollandaise is, we think, the single greatest thing that some poached eggs can aspire to go out with! There is a lot going on about the difficulty of creating the perfect Hollandaise sauce, once you understand the science of it; it will be life changing! Breakfast and Brunch to another level! The trick, according to food science god Harold McGee, is "heat the egg yolks enough to obtain the desired thickness, but not so much that the yolk proteins coagulate into little solid curds and the sauce separates". Our trick? An spicy touch of Spike Paprika Sauce ! https://hotboxlondon.co.uk/wp-content/uploads/2019/03/Poached-eggs-and-avocado.png 519 585 Ana Lucia Alonso https://hotboxlondon.co.uk/wp-content/uploads/2019/04/hotbox-london-logo-300x59_bdaf57822e17803d1b86f6b94fc2dd26.png Ana Lucia Alonso2019-03-06 17:56:212019-03-15 12:25:31How did Eggs Benedict get its name? Healthy Brunch London: What are the healthiest items on our menu? It is the time of year when people make new year's resolutions, and those promises often involve eating more healthily. But panic not!, this doesn't mean you have to lock yourself away at home and never enjoy the delicious food of Hotbox. We are here to provide you with a guide on the healthiest items on our menu - enjoy! Hotbox - not just for meat-lovers! BBQ Jack Fruit Slider: The closest thing we can get to a vegan bbq slider that tastes like meat. The texture is like pulled pork and our vegan BBQ sauce packs all the same flavour punch you’d expect from our regular sauce. Schwarma Aubergine: Delicious smokey aubergine, doused with schwarma spiced butter and finished with pomegranate molasses, tahini and pine nuts. Giving smokey flavours to the aubergine and feel the HotBox spirit even been vegan! https://hotboxlondon.co.uk/wp-content/uploads/2019/01/Grilled-Chicken-at-Hotbox.jpg 800 1280 Ana Lucia Alonso https://hotboxlondon.co.uk/wp-content/uploads/2019/04/hotbox-london-logo-300x59_bdaf57822e17803d1b86f6b94fc2dd26.png Ana Lucia Alonso2019-01-26 12:33:522019-03-15 12:25:48Healthy Brunch London: What are the healthiest items on our menu? Our famous Bottomless Brunch menu runs from Tuesday through to Sunday from 11:30am to 2:30pm (Sundays until 3pm) and is a great option when you want to enjoy a boozy brunch in London. Hotbox is the ideal place to meet friends at the weekend, or indulge with colleagues during the week. The atmosphere is lively and it is well-situated near many bars so you can keep the party going well into the evening. For £25 you can enjoy bottomless Prosecco, Mimosas and a selection of Winter Cocktails, one drink at a time, for 2 hours from your the time of your reservation. (you can mix and match your drinks throughout the meal). Food is not included. What makes it the best brunch in London? The concept of ‘brunch’ is synonymous with American dining and our menu will transport you across the Atlantic, from enjoying a brunch in East London to feeling like you are on the Texas plains. To start with, the bottomless drinks menu offers a range of Bloody Marys and we have a strong feeling that the afternoon could get a bit lively! The menu has all the American classics you would expect including Buttermilk Pancakes with bacon & syrup as well as Ribs from the famous smoker and some luxurious Truffled Eggs. Some menu delights to get your mouth watering include ‘Crushed Avocado’ - Yes, avocado on toast is still very much a trend but this combination with roasted corn, feta and poached eggs is fantastic! And to quench your thirst, the Bloody Tango (Gin, Tomato Juice, Chimichurri & Wine.) - we think this one speaks for itself! Classic Cocktails With A Twist!